If you are planning to spend a wonderful summer vacation in Branson without the heat of the sun, you can enjoy the fun inside your accommodation or in many indoor attractions because staying in Branson log cabins or in some indoor places is a great way to enjoy the fun when it’s hot outside. Thousand Hills Golf Resort is home to a variety of accommodations including log cabins, condos and townhouses. With great features of amenities like indoor and outdoor pools, tennis court, fitness center, and game room that offers arcade games and more, the resort is the perfect place to stay during the hot days. Beautifully located in a secluded place near the Ozark Mountain, Branson log cabins give every guest the opportunity to see spectacular views of the natural scenery, wildlife and rolling hills. Every log cabin at Thousand Hills features front and back porch where it’s great to feel the morning breeze as you sip a cup of coffee. While you’re winding up on the porch, you can feel the relaxing atmosphere, the cold breeze that snaps your face, you can even hear the sweet sounds of the streams, and the sweet tweets of birds. When you spend a wonderful vacation at Thousand Hills, you don’t just enjoy your stay in your accommodation, you can also enjoy exciting indoor and outdoor fun activities around the resort. Spending a wonderful stay at Thousand Hills Golf Resort is like no other with all the perks that come with luxurious and comfortable stay in a cozy log cabin. Each Thousand Hills log cabin accommodation has an area of 1,450 square feet that can comfortably accommodate a family of 8. Every log cabin also features a sofa sleeper that provides sound sleep to extra guest. The living room is fully furnished with great amenities such as cable TV with HBO, wireless internet access, and a DVD player. So if you bring a laptop, a smartphone and lots of DVD movies to watch, the indoor fun activities that you want to enjoy inside the log cabin accommodation are endless. So, you don’t have to worry if you can’t go out to enjoy exciting shows as you have all the alternatives inside your log cabin accommodation. You don’t even have to worry also eating out for lunch during sunny days. 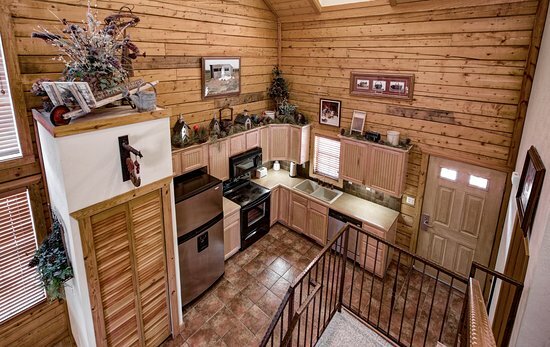 The kitchen of every log cabin is fully equipped with modern appliances such as fridge, microwave oven, dishwasher, oven, dishes, pots and pans, and kitchen wares and utensils. With these complete furnishings in the kitchen, preparing delicious food inside your accommodation is breeze and can be easily prepared even for big group of 8. If you are staying longer, you don’t have to worry also with dirty clothes, as each log cabin is furnished with washer and dryer. And when you can’t wait to enjoy other indoor activities on the water aside from the pools at the resort, why not visit the Splash Country Indoor Water Park at Grand Country Resort in Branson. You can enjoy here fun indoor summer activities without the heat of the sun. This beautiful water park features 3-story treehouse complete with water slides, toddler pool, lazy river, a 1,000 galloon tipping bucket, basketball, pool, hot tubs as well as a season outdoor park. Inside the water park, you will also find Mining Company Grill which offers burgers, hot dogs, French fries, funnel cakes and more. Your summer fun in Branson will not be complete if you don’t try exciting water activities at Splash Country. Located at the Grand Country Square entertainment complex, Splash Country Indoor Water Park is one of Branson’s most impressive water parks as this is one of the very few parks where great water fun activities can be enjoyed all year round. This water park in Branson was designed to be a great vacation destination for families as the park features the most water fun activities where every visitor is sure to enjoy a wonderful summer fun in Branson. Splash Country is a great place to relax and have some fun with the whole family and friends as it features exciting water rides and great water activities to help make your summer vacation in Branson a memorable one. Water attractions at Splash Country can be enjoyed indoor and outdoor – which allows you to have more hours of fun no matter what time of year you’re visiting or whatever the weather is like during your visit. The exciting indoor water activities offered at Splash Country include a fun and exciting basketball game at Basketball Play Pool; a bubbling water and jets that provide a natural hot springs at Melting Pot Spas; The Lazy River, great for those looking for relaxation, as the calm current takes you along more than 250’ of tranquil waters; The Treehouse, towering over the water features beneath and includes 1,000 gallon bucket that splashes to those who are beneath it; and Toddler Pool, built for fun for the youngest ones, with slides, swings, and more than 2,000 square foot area. There is also an outdoor water attraction at the park that you can enjoy that include Lounging Areas, this specially-designed areas have been designed for your comfort to let you sit back and relax before you start a water fun activity; Eureka Mine which takes you down a thrilling waterslide ride down which is sure to give you a heart pounding experience; Froggie Bog, shooting jets of water coming from five different levels; and Hatfield Holler, a great attraction ideal for guests who want to take a challenge with a twisting creek that runs right through the heart of Hatfield Country, along the way, McCoy’s lying-in wait can use waterfilled buckets and will pour to anyone who comes sliding by. Other Indoor activities in Branson can also be enjoyed at the Butterfly Palace and Rainforest Adventure. This fascinating attraction offers Mother Nature’s wildlife environment up close for all visitors to enjoy. With great features of many areas to explore, the Butterfly Palace has so much more than those little stunningly beautiful, fluttering creatures. You’ll get to see inside the palace a blue-eyed skink, fascinating tree frogs, gorgeous birds, and geckos. You’ll be fascinated also by the lush greenery and the exquisite flower beds around the garden. You will also find a Butterfly Aviary inside the palace which is beautifully filled with lush greenery, tropical plant, and beautiful birds, with colorful butterflies flitting and flying about; it’s common for this beautiful creature to rest on you. You’ll find also inside the Butterfly Palace, the Emerald Forest Mirror Maze that will have you questioning where’s the right way as you wind your way through; this is a maze that replicates what it’s like under the thick canopy of tropical growth in the rainforest. You will also discover all sorts of critters, like giant cockroaches, poison dart frogs, salamanders, and chameleons at the Living Rainforest Adventure. The palace also features Banyan Tree Adventure, where you’ll find the Magic Pond, and you can climb all around the twisted roots of an authentic-looking replica of India’s national tree, the Banyan. If you want to enjoy fun indoor summer activities while you stay in Branson log cabin accommodation, try these exciting indoor activities when you want to hide from the sun.